WARNING!!!! - Methanol is flammable and toxic. Do not let it touch your skin or get in your eyes. Wear proper protective gloves, clothing, and eyewear at all times. Same thing with ethanol. Lye is also very caustic - do not allow it to touch your skin or clothing. When you mix the lye with the alcohol, it creates an even more toxic substance and toxic fumes which you should be very careful with - do not come into contact with it in any way. Always be in a well ventilated area. Also... you are 100% responsible for your own safety. The author is not responsible in any way whatsoever for personal injury or damage to your engine. Here is a general description of how to make biodiesel fuel using methanol, lye, and used cooking oil. This process is called transesterification. You can buy methanol from your local racetrack or chemical supply store. You can buy granulated lye (sodium hydroxide) from your local grocery store or hardware store. You can also buy the biodiesel supplies HERE. Make sure you filter the used cooking oil before using. Fry oil filters can be purchased in any good restaurant supply store. The oil also must be warmed up so it is not solid or lumpy or thick. You can use the sun to heat the oil or some kind of water heating element or a electric or gas burner of some sort. The ideal temperature is 120° F. If you are using flames, remember that the methanol is extremely flammable and you should turn your burner off before getting the methanol mixture anywhere near it. Of course, this should all be done in a well ventilated area too. Hint: to determine the amount of lye needed to start the transesterification process to make biodiesel, do a small test batch first. You don't want to mix up a large batch only to find out that you did not use enough lye. Some used cooking oils may contain different amounts of animal fats. The more animal fat in the vegetable oil, the more lye you need to start the process. Start with just 1 liter of oil and 200 milliliters (1/5th of a liter) of methanol and 4.5 grams of lye. First, mix the lye in with the methanol until dissolved (this creates sodium methoxide - very, very caustic - be careful). Then mix the sodium methoxide with the vegetable oil and mix for 1 hour. After mixing, let it settle for an hour or two and it should form two distinct layers of biodiesel (top) and glycerin (bottom). If there are not two distinct layers, repeat the whole process with 5.5 grams of lye. You can also perform what is called a titration... Dissolve 1 gram of lye into one liter of distilled water and dissolve 1 milliliter of vegetable oil into 10 ml of isopropyl alcohol. Then drop the diluted lye into the diluted vegetable oil one ml at a time. After each ml, measure the pH of the diluted vegetable oil with litmus paper or a pH meter. When the pH rises significantly, the free fatty acids will be neutralized. The ideal pH is between 8 and 9. The number of ml used will equal the number of extra grams of lye to use per liter of vegetable oil (starting from 3.5 grams of lye). You can get a titration kit HERE. So, let's assume 5.5 grams of lye produced the desired distinct two layers. We now want to scale it up to a 10 liter batch. So we need 10 liters of used cooking oil, heated. 2 liters of methanol and 55 grams of lye. Mix the lye with the methanol until dissolved and then pour the sodium methoxide mixture into the vegetable oil. Stir for one hour. The mixer can be a sump pump setup or some sort of mechanical electric mixer like a paint stirring setup. After mixing, let it settle for 8 hours. After settling, you can siphon or pump the biodiesel from the top or drain the glycerin from the bottom if you have a mixing container with a valve at the bottom. After washing, run it through a Racor fuel filter before burning it in your engine. The bottom part after settling is glycerin. If you allow it to sit in the sun for a week to evaporate all the methanol, you can use it as a degreaser or to clean your hands. 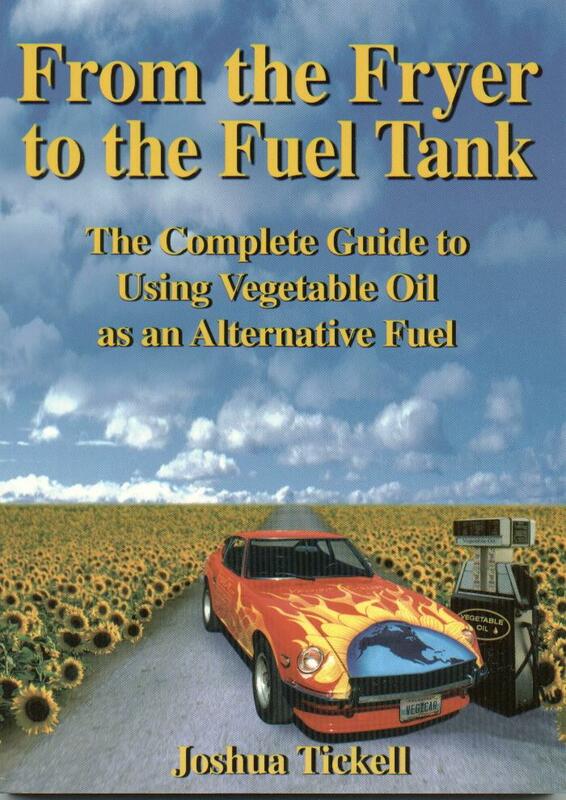 To learn how to make liquid and hard soap from the glycerin, get the best book ever written on biodiesel.... "From the Fryer to the Fuel Tank". This book gives you everything you ever wanted to know about how to make biodiesel including how to build your own processor. Washing your biodiesel... after the above process is completed, you should "wash" your biodiesel fuel to remove any residual soaps suspended in your fuel. The easiest way to get rid of the unwanted soap is to simply add water. The water will emulsify with the glycerin soap and settle to the bottom. So to perform the wash, simply spray an equal amount of water on top of your biodiesel and let it settle to the bottom for 12 hours. Drain the water off the bottom of your container with a valve and then repeat the process 2-3 times until the water drained off is clear. Heat your biodiesel up to 130° F for 20 minutes to evaporate any residual water and you are literally ready to go! Remember to filter it in a 5-10 micron filter before burning it in your engine. Other ingredients - Instead of using methanol, you can use ethanol to make biodiesel. Ethanol is less toxic than methanol and is considered a "greener" fuel than methanol. Ethanol is "grain alcohol" and is usually made from corn which makes it a renewable fuel. Methanol is highly toxic and is made from fossil fuels or it can be distilled from fermented wood. That's why it's often called "wood alcohol". Also... you can use potassium hydroxide instead of sodium hydroxide. I believe you'll have to use 1.4 times as much potassium hydroxide as sodium hydroxide though. Make sure you do your "test batch" first! 1) You might be wondering... what kind of engine I need to use biodiesel... basically, biodiesel will run in any diesel engine unmodified. (Update: blends like B5 or B10 can be run in any engine, but some newer engines that have DPF exhaust filters can't handle B100). Biodiesel is a solvent, so if you put it in an old tank or use it with a diesel engine that has been running regular diesel, it may clean and dissolve some "residues" and then the residues will clog your fuel filter. Changing the filter often when you first start using biodiesel usually fixes this problem. Usually, manufacturers warranties are not voided when biodiesel is used, but check with your manufacturer to make sure. Sometimes a blend like B20 is required (20% biodiesel). If you are running straight vegetable oil (SVO), then you need to make modifications to pre-heat the oil to decrease its viscosity. 2) The only other problem you might have is with natural rubber gaskets and hoses in vehicles made prior to 1992. The biodiesel may degrade these types of rubber and they may need replacing after a while. Newer engines have been modified (synthetic rubber) to stand up to the newer blends of diesel fuel that have been in use since 1992 and these engines will work fine with biodiesel.